Here is the form to give me some feedback for my tutorial. This unit in technology, we have created our tutorials. Our tutorials had to meet a set of criteria which our class made, and the criteria was basically some things the tutorials should have. We did not have to meet all of the criteria but we would have to meet most of the criteria. A criteria I think I have met is strategy. I think I have met the criteria of strategy because I explain a few tips on different ways to tuck, which may help out some people if it is hard for them to do it the other way. I also give advice on helping out to do the flip because I teach them the “Front Drop Roll” which is basically a front flip but landing on your back. Another criteria I have met is, in order because I started from a good starting point which is just learning how to jump higher and that’s very helpful, then I gave advice and tips. It would have not been in order if I had given tips then shown how to tuck because then it wouldn’t have made sense for the audience. Lastly I reached the criteria of title because my title explains clearly what I am going to show and what you are going to use that skill in. Some new ideas I got about tutorials that extended my thinking were from watching Ro and Aner’s tutorial. I got the idea that you don’t have to use titles because you have already explained it. Another Idea I got is that editing is sometimes good to change around your video if it is too shaky. An idea which I got by watching other tutorials is that it’s a good idea to make your tutorial fun by maybe adding a montage or showing something you can do with the skill you learned. A thing I am still challenged by is finding the right music to go with my tutorial. I spent 30 minutes trying to find a good song that would match with my tutorial on Jamendo. all I could find were distracting songs which did not even match the topic of my tutorial. A question I have is, how many different ways of planning are there?. Over the years in YIS I have learned a few ways to plan stories and such but I would like to know how many ways there are to plan. This unit was really interesting and making my tutorial was challenging and fun. The part I liked the most was filming because it was the part where I got to do the action. I think the planning was quite helpful because I learn’t a new method of planing and I got to think of different ways to improve my tutorial. Hopefully I will get to make more tutorials in future technology classes. The components of fitness I need to improve on as a Ultimate frisbee player and a basketball player are Cardio Vascular Endurance and Muscular Endurance. I think I need to improve on my CV Endurance because in Ultimate frisbee and basketball you need to start sprinting very quickly and sprint across the field, and normally after 15 minutes of playing I get very tired and I can’t play very well. I think I need to improve my Muscular Endurance because in Ultimate frisbee and in Basketball you use your arms very much because you have to shoot and throw accurately. In basketball and Ultimate frisbee I usually don’t get very tired after throwing/shooting for a long time but I think I should make sure that I don’t get tired so that I can play at my finest. I believe, Folk Music is music from particular regions which have their own folk tales and traditions. They pass these traditions and stories down through the generations which have morals and moods to them. I think that mostly these songs are used to show the history of different nations and regions. Some Spanish folk instruments were the Flamenco Guitar, Cajon (drum), Palillos (sticks) and Palmas (hands/clap). Traditional Spanish folk music is usually not sang but played with different instruments. The rhythm is the most important part of Spanish folk songs. el caballo en la montaña. Verde, que yo te quiero verde. su cuerpo de fría plata. See: I see a close up dandelion . 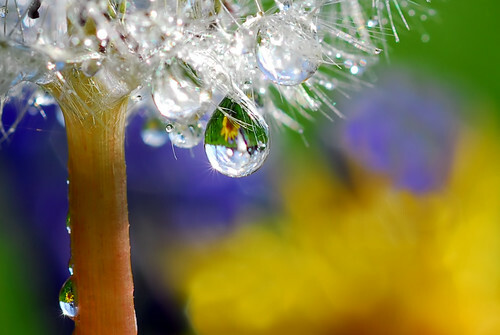 I also see that the dandelion is wet and that there is a drop of water about to drop to the floor. I see that the drop is reflecting a flower that is in the background. In the background I see yellow, purple and green colours. Think: I think that the background is of other flowers because the blur looks like petals and the tip of a plant which is purple. I also think that this picture was taken in a garden because I can see grass in the background. Wonder: I wonder who thought of the idea of taking a picture of a weed in their garden. Normally it would be plants.